The Original SeaStar Solutions® Steering System! For over 35 years, Big-T® has been the most durable, versatile mechanical steering system made, with both single and dual station capability. The heavy duty helm incorporates a strong steel pinion, dual diecast gears and meaty shaft bearing supports, all encased in a rugged gear housing. It’s no wonder owners of small inboards have counted on the SeaStar Solutions® Big-T since 1963! Inboards to 34 feet with one engine. 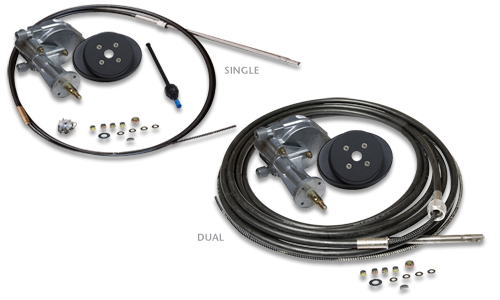 Also suitable for sterndrive boats with power-assisted steering. Big-T systems accept steering wheels up to 20” diameter. Single system uses SeaStar Solutions® SSC61 type cable. Dual system uses a special-order, non-returnable type cable SSC81AxxBxx. • Available in single or dual station versions. • Responsive 3 turns from lock-to-lock. • 2-piece bezel for 90° or 20° helm mount to dash.